'I just want to make it clear up front that I don't want the job,' the Rat fumed and hung up the phone. Although the info-czar post was still just the subject of congressional meditations, the Rat wasn't leaving anything to chance. He called everyone he knew who had any kind of potential influence over appointments, including the campaign chiefs of all the presidential contenders. Green Party candidate Ralph Nader was especially gracious when the whiskered one reached him, despite the uncivilized hour. So why was the Rat taking such a role in removing himself from a contest that didn't even exist yet? First of all, it's bound to happen'if only because the Office of Management and Budget is resisting it. And the way the Rat's life has been lately, he's sure that he would get tagged with the job as some sort of karmic punishment for misdeeds in a previous lifetime. Second, he has experienced a disturbing vision'while coaching youth-league soccer'of what the job would be like. Now the Rat finds himself out on the field as often as three times a week partaking of'eek'physical activity with a whole herd of ankle-biters. Soccer practice has amply demonstrated how well his situation mirrors what the uber-CIO will face. Getting the undivided attention of a dozen first- and second-graders is hard enough. Getting them to act on what they are told is another game entirely. The whiskered one's leading scorer has made seven goals so far, five of them for the other side. The Rat bets that a czar of federal information services will have the same fundamental challenge when it comes to communicating policy and strategy to agency heads. The czar probably will have just about as much luck, too. The soccer team's budding Mia Hamms and Cobi Joneses all want to be the star of the game, and so they all bunch around the ball. The same thing will happen to an uber-CIO, only he or she will be the ball. Every career-minded agency info officer will be all over whatever project looks to be the most prestige-enhancing. Getting agencies to coordinate efforts and cooperate will be like getting 6-year-olds not to ball-hog. 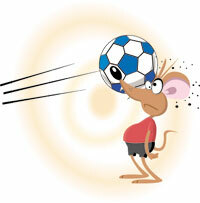 But there's one thing that the Rat has going for him on the soccer field that a federal CIO wouldn't have. 'At least I can wear shin guards,' the whiskered one sighed.